First stop: New York City. To meet up with pals Andy and Ali at the Electric Literature offices. And the next day to the Guggie. And the next day to see Gerhard Richter drawings. And two days in a row at Central Park. Three beautiful days in Brooklyn and Manhattan, dining with Dad's agent and new editor, meeting all his new people. This is what a working vacation looks like. Here I am! 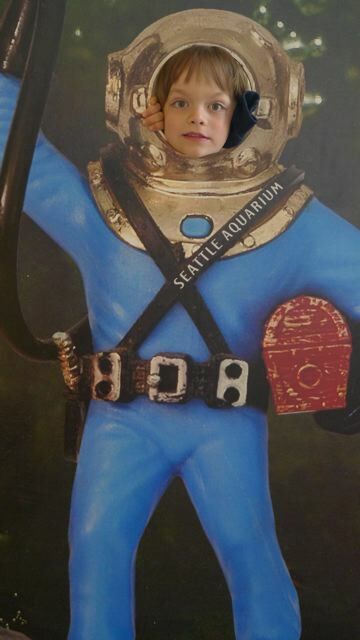 In a scuba suit at the Seattle Aquarium. I had a vacation with Bobby and Mamop while my parents had a vacation with each other, somewhere else. Mamop took me to the Aquarium where I saw a squid and a great white shark and tons of other ocean type things which my class back home happened to be studying at the same time. And I brought all my school homework with me to Bainbridge in case you think I was playing major hooky or something. If there's anything you want to know about sea life you can ask me because I probably know the answer. For instance, do fish urinate? Answer: you bet they do. 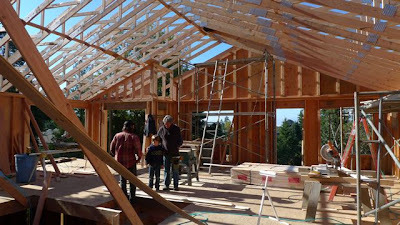 I also went to work on the job site with Grandpa and Uncle Victor and Justin, always a good bro time. Big Vic gave me a box full of fun and exciting found gifts as always. Like Santa Claus with a tool belt. 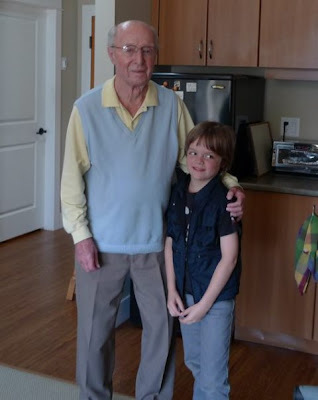 And, Bobby and I drove all the way up into Canada, the BC part, to visit my Great Grandfather Ainsley Dagg. This is my second trip to Canada to meet my second great grandparent. It's like a thing Grandpa and I do, a very special important thing. My Great Grandpa showed me pictures of my Great Grandma Daphne who isn't around anymore which is sad, especially for Ainsley. 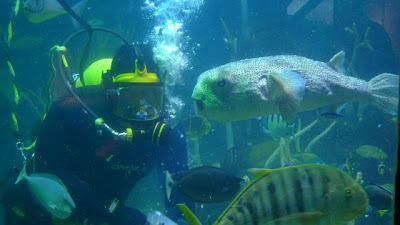 But I think we perked him up just a tiny bit with our visit and he seemed happy to meet me. 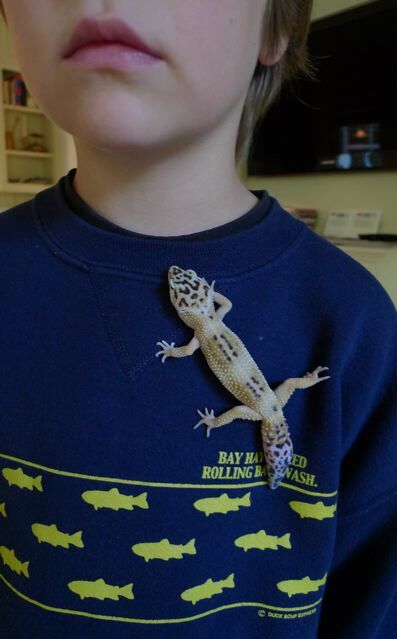 And this little guy was also happy to meet me! 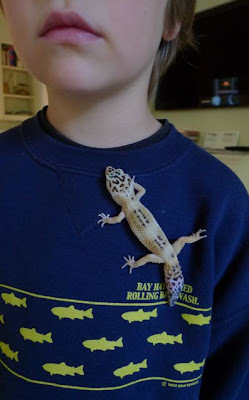 He's my cousin Ian's pet lizard and he crawled all over me like I was some kind of tree. Super fun time all around. I had a great vacation, filled with movies and football and more pancakes than anyone has ever seen. Thanks to my GPs for taking such good care of me especially Mamop who played about sixty games of UNO with me. I had a really really really good time! To all of you who still check in every once in a while to see what little old me is up to, I'm really sorry that it's been such a long while since I've told you anything that is up. My parents and I have been traveling the world a bit: Bainbridge Island, British Columbia Canada, New York City and even Paris, France. I still don't have all the pictures in order, but stay tuned and I'll show you and tell you who went where and how it was. For now, know that I have missed YOU! And also for now, just for tiding over purposes, here's a little video from my toddler past, waking up from a nap. Mom, Dad, Stuart and I have been watching it and laughing at it and quoting it a lot lately. "The Easter Egg Bunny, you know"